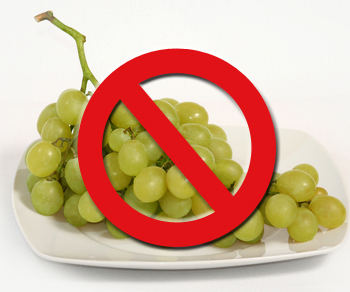 Ingestion of grapes or raisins may result in acute kidney failure in dogs. At this time, anecdotal evidence suggests that cats may also be affected. Symptoms usually begin within several hours after ingestion. Initially, symptoms may include vomiting and lethargy. This may proceed into an increase in thirst and urination, weakness or the inability to stand, and possibly the inability for the kidneys to produce urine. Once an animal has reached this state (which may occur within 24 hours of ingestion), treatment may be ineffective in reversing the toxicity and death may ensue. Why and How Are Grapes and Raisins Toxic? At this time, we do not know why grapes are toxic to pets. There is also no known mechanism of toxicity. In fact, some animals can tolerate large amounts of grapes with no side effects. Other animals, however, may go into renal failure with as little as 0.7oz per kilogram. Meaning that if a 20-pound dog ate even just a few large grapes, renal failure may ensue. Raisins are more concentrated, and therefore may require even less for toxicity. As with many toxins, timing is extremely important. Take your dog (or cat) to a veterinarian quickly after grape or raisin ingestion. If you get your pet to a vet shortly after grape or raisin ingestion, vomiting can be induced to remove as much of the toxin as possible. This is typically followed by treatment with activated charcoal, which is a substance that will help bind any toxins. If treated quickly, most dogs have a favorable prognosis and will recover uneventfully. If an animal ingests grapes and isn’t treated quickly enough to induce vomiting, your vet will likely recommend several tests and treatment. First, we need to know the status of the kidneys. Blood and urine testing accomplish this. These tests may be repeated multiple times during your pet’s hospitalization. Your vet will also likely recommend IV fluid therapy. Typically, an affected animal is treated for at least 2-3 days after ingestion if there are no complicating factors. Are you financially prepared if your dog or cat eats something toxic? Pets Best Insurance reimburses off the veterinarian bill. You can choose from 70% reimbursement up to 100% upon enrollment. Read pet insurance reviews to learn why clients love Pets Best.